Are you ready to get outdoors and start enjoying the summer weather? Or do you have children who have just finished up a school year and will be out and about enjoying their summer vacation? Summertime is the season that the most traffic accidents tend to occur – While there are various reasons of this, some include that there are more drivers (including inexperienced teen motorists) and other travelers (including pedestrians) on the roads. Brushing up on the following pedestrian safety tips can be essential to enjoying a safe and fun summer. Stay safe this summer – and keep your kids safe – with these essential summer pedestrian safety tips, our Littleton car accident lawyers explain. Contact us if you’ve been hurt in a traffic accident. We can help with your financial recovery. Always be alert to motor vehicles – In fact, as a pedestrian, it’s best to assume that a vehicle will be approaching your vicinity at any moment. Operating under this assumption can help you make it a habit to look both ways before crossing the street and take other necessary precautions to stay safe and avoid being hit by a vehicle. Only cross the street in designated crosswalks – And only when the signals permit crossing. In other words, do your best not to jaywalk and/or cross the street when vehicles have green lights. It only takes one distracted or drunk driver to miss seeing you in the road – and getting hit by a car can have life-threatening implications even if a vehicle is going 10mph or slower. Follow all traffic laws – While pedestrians have the same rights as motorists to be on the roadway, they also have the same obligations to comply with traffic laws. 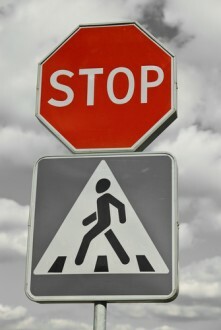 So, as a pedestrian, be sure to do your part to follow the law – it could save your life. Be as visible and predictable as possible to drivers – If drivers can’t see you or think you will be doing something other than you intend to do, the risk of a pedestrian accident increases exponentially. So, wear bright clothing, be where drivers expect you to be and only proceed when you are sure nearby motorists are aware of your presence. Make sure children under 10 are accompanied by an adult when crossing streets – Young children are often hurt in pedestrian accidents because kids often don’t know (or don’t remember to follow) the laws and/or because motorists may have a hard time seeing kids. So, reduce the risk of injury to your children by making sure an adult is always with them when crossing the street. Have children play in areas away from streets and moving vehicles – If your children will be playing outdoors a lot this summer, have them play in areas that are not near moving vehicles (i.e., streets, parking lots and driveways). This will significantly reduce the chances they’ll be in situations that could increase their risk of a pedestrian accident. Have you been hurt in a traffic accident? If so, the Littleton car accident lawyers at Bahr & Kreidle are ready to help you get on the path to justice and financial recovery. Since 1983, our attorneys have been fighting on behalf of injured people and aggressively standing up against injustice, inequality and intolerance. Our lawyers are committed to advocating injured people’s rights, helping them hold negligent parties responsible and ultimately getting them the highest possible awards for their injuries and losses.